Status seeking is an idea borrowed from 1960’s intellectuals, whose thinly-veiled critique of growing consumerism was questionable even in its time. What brings status has changed dramatically over the decades. 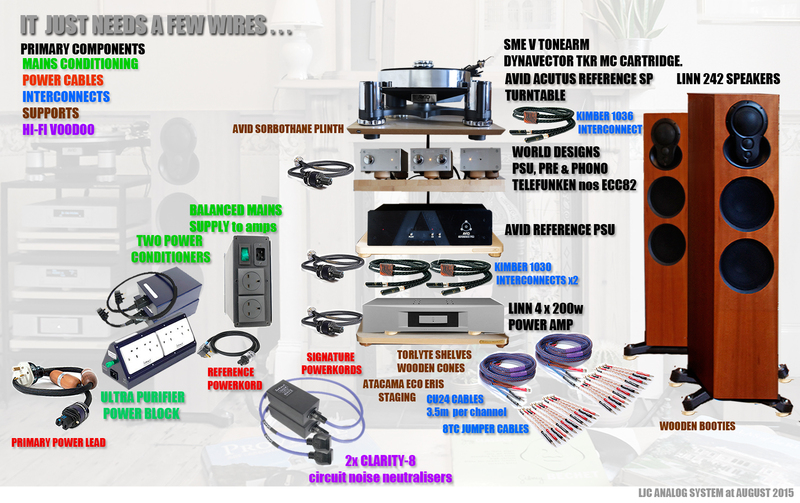 Boast expensive cables on a hifi forum and see what you get: mockery. The age of the internet has elevated inverted snobbery. Worse, anxiety that someone might be making “easy money” out of you is a meme which can interfere with your will to improve. What if they were, and it is still better? I haven’t tried everything or even most things. I have tried a few manufacturers and settled on one that works for me, trading up through their range. 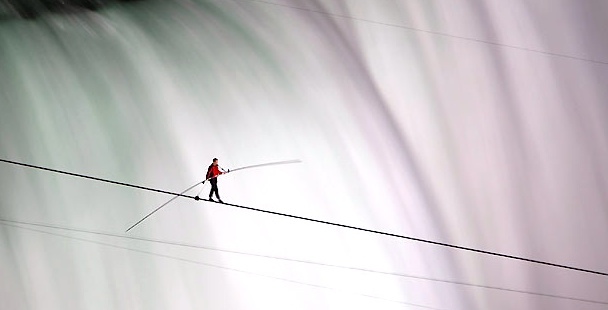 There may well be far better ones out there, but life is too short to try everything. I have learned to trust my ears, not other peoples. Only I know what I hear, no-one else does. I decide whether it sounds better or it is not, the rest is just noise, interference. Rule One: forget upgrading equipment, first upgrade power and connections. There is one “focus of interest” on the part of hi fi equipment manufacturers: to sell you another (better) piece of equipment. Their business model is a product-range escalating by price-point and performance level, from entry-model to reference-model, and of course they all have features taken from the model above. The midrange gizmo uses the same thingamy as found in the top of the range Reference gizmo. Trading up the product range is the least bang per buck imaginable. You need to unleash the potential of what you have already got, and the key to that is all the bits that power, support and connect it. Supporting, powering and connecting hi fi equipment to reveal the sound it is capable of requires replacing the inexpensive plugs and cables that the manufacturer popped in the box. They worry only about price-competitiveness of their equipment. They can not afford to give you quality interconnects, which can cost as much again as the equipment itself. There are some very effective but expensive interconnects out there, due to the superior conductivity of certain precious metals like silver (whose high cost is due in large measure to the activity of commodity-speculating US hedge funds) not to forget platinum and rhodium-plating. The power/interconnect/support upgrade path will enormously enrich your listening experience, but it is not for the faint-hearted or peniless. It takes a measure of faith to invest in hifi improvement. It will pay back in spades but it can be a bumpy old journey along the way. 1. Power: cables to deliver a continuous pure 240 volts at 50Hz, free from any source variation, intrusion generated by other appliances on the domestic circuit, or radio signal interference effects. 2. Interconnects: to eliminate any interaction between the signal and the cable, such that 100% of what goes in comes out. The wires closest to the signal source are the first priority (eg tonearm and phono-stage), those further downstream nearest to the speaker are the least important. There are still other factors such as room dynamics, earth quality, and many more, but as regard these three major objectives, none will occur naturally with main components out of the box. Managing them will allow you to hear the best from your equipment, generally at lower cost than upgrading to “better” equipment. It’s also a lot more fun. Starting at the valley floor and ascending towards the mountain top (which incidentally you can never reach), at the early stages, you get to hear “more” – more bass and more treble, more convincing stereo imagery, greater instruments separation, hear things you had not noticed before. You may also begin to experience the shortcomings of parts of your system, the expansion of the bass floor may result in loss in higher frequencies, cymbals recede or disappear, many weeks of worse sound before new wires burn in and eventually blossom. It is not all good! When everything is sounding pretty good, you feel you might just rest, but the next level offers a quite different range of improvement, little to do with “more” hi-fi effects. From here improvements begin to yield more musicality. The interaction between instruments and musicians falls into place, the music becomes more coherent and easier to follow, the artist’s musical intention clear, and the music delivers more intensity of emotion. This stage is enormously satisfying. Any improvement now to the signal source, like cartridges, arm, and valve phono amp and power supply, you will get the full benefit of, whereas before it would have been held back. Bear in mind, you have to do it all – power, interconnects, and supports – maximise source fidelity before it gets to the main amplifier and speakers. Your system should now have become intensely revealing, you listen to older records with new ears, discover more music. Well, there you go, Steve. They say that if you are a fool, it’s better to keep quiet and leave the matter in doubt rather than broadcast it to the world. Still, Steve can punctuate correctly, so he at least got something out of his expensive college education. Where next? The only way is up. I don’t know where it goes from here, but I sure as hell intend to find out. I have found it more difficult to recognise immediately the benefit of an “upgrade” , and more easy to recognise the opposite – the loss from a “downgrade”. I could come up with a theory why, but I find explanatory theories – the why – a distraction from identifying the experience – the what. (I could come up with a theory to explain that too). Start with your system warmed up and pick one familiar LP track. Get your baseline “ear in gear” as it were, with a couple of listens. Take your time to enjoy the music. Next, swap in the new cable – the upgrade. Listen to the entire track again. Reflect on any reactions – particularly the ease of following the music, your emotional reaction, any changes in dynamic range, anything that comes up. You are most at risk of expectation bias at this point, so play the track again, to establish a new baseline. Be wary of noticing new detail, which can be due simply to repeat listening. Next, refit the original cable, replay the track, and think about the same questions now you have potentially ” downgraded”. Does it sound more muddled, less emotional, are you feeling the loss of anything dynamically- is the bass more dominant and booming? How’s the top-end? Listen again to the track. At this point things often snap into focus: you get a clear sense if you have lost anything by going back, and what. It is usually much clearer than identifying any gains, and less prone to justifying the cable’s expense. Repeat the step up, play, and step down, as many times as it takes, until you have confidence in your conclusion. A:B:A:B:A:B. If there is nothing to chose between the two or you are still not sure, return the cable and you will be rewarded by saving a great deal of money. 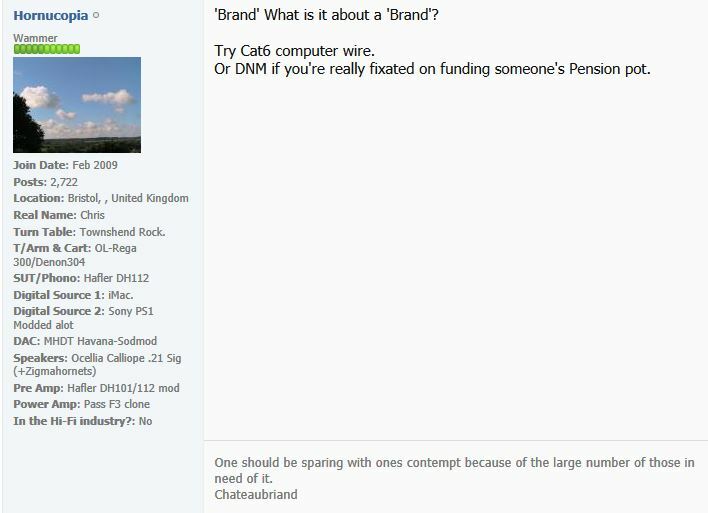 The penny dropped about cable-skeptics recently when I browsed a hifi forum thread on the subject of cables. Hi Fi forums are, as you might expect, populated with equipment snobs (see left panel). Nothing is more threatening to an equipment snob than the suggestion that what they hear is largely influenced not by their impressive choice of exotic and fastidiously-chosen equipment but by its “humble” interconnects and power cables. Chap above doesn’t mention even one. That opinion can’t be allowed. The response is almost always the same, the “marketing trick” ad hominem : someone is making easy money out of a gullible fool.You wouldn’t want to be a fool, would you? After you have read its variants a few hundred times you see how these characters protect their vanity: moat and drawbridge. Before you ask, yes, I have a qualification in psychology. What ever happened to science: test, experiment and conclusions? Unfortunately I am retired so can only progress to your level of RA gear with a Lottery win, but well done you. Yes the de-waxing is available on the NHS. Not sure how much Russ would charge, but it would be very expensive as he would have quite a network to set up. All my Interconnects, speaker and power cables are from Signal Cable. There are two pivots in which will effects the total sound of a system. Your stylus and your speakers. Have you tried monkeying with the actual power supply? If you accept what comes out of the wall socket as “a given”, you are right in that different bits of the system can be made to sound better. I found that working on the power supply itself made an amazing difference to everything else. Electricity is what makes the world go round. Dont know signal cable, but see if they make any kind of power conditioner or balanced mains. You have good times ahead if you tackle these. Yes, I have a power conditioner made by Monster hts 2600. It does make a difference. It was the first thing I bought but my sustem has completely changed. I’m all about DIY Tube gear so i probably need to upgrade. Fasinating, and a great montage of your wires. Surely, though, wires are just wires. it’s the equipment which makes the difference. If the wires enable you to hear how good the equipment is, is the credit down to the equipment or the wire – the chicken or the egg? On my experience I think the balance is 2:1. Spend 65% of your budget on the equipment and 35% on the infrastructure, and you maximise the potential of both. I’m sure these wire is a wire responses are planted. If you can hear no difference between different wires you are VERY lucky and will save yourself a lot of money, I dare you to trust your ears. There could be a problem with your ears, and that is a serious point. I am a muso and in the course of my musoness I do quite a lot of sound engineering. I set up for a gig a few weeks ago (all acoustic, no high decibel stuff) and people were telling me it was too loud. It sounded fine to me but I realised I was having problems understanding what was being said to me. A week of oiling my ears followed by a session with the syringe which, in the right hands is quite a blissful experience, and the wax was gone, and the music was sounding better than I had heard for quite a long time. This can be classed as a no cost improovement. I use Russ Andrews wires from supply to front end. Not cheap, but not the most expensive, and VERY effective..
Hi Bob, Glad to hear you are a Russ Andrews fan – good taste. These posters are all LJC regulars, I assure you, I think Guy was just being “provocative”. I think of a better interconnect as reducing the amount by which the interconnect interferes with the quality of sound. It can’t add anything but permits a more faithful rendering of what is coming out of the hardware. I’ve upgraded Kimber interconnects from KCAG to KS1020, to KS1030, and now auditioning a KS1036. Every step has been a complete revelation, especially the last. However I haven’t tried Russ’s ear syringe. Can you get it on the NHS? londonjazzcollecter, i see you use a signature superkord to connect power block to wall socket and signature powerkords to connect components to your block. 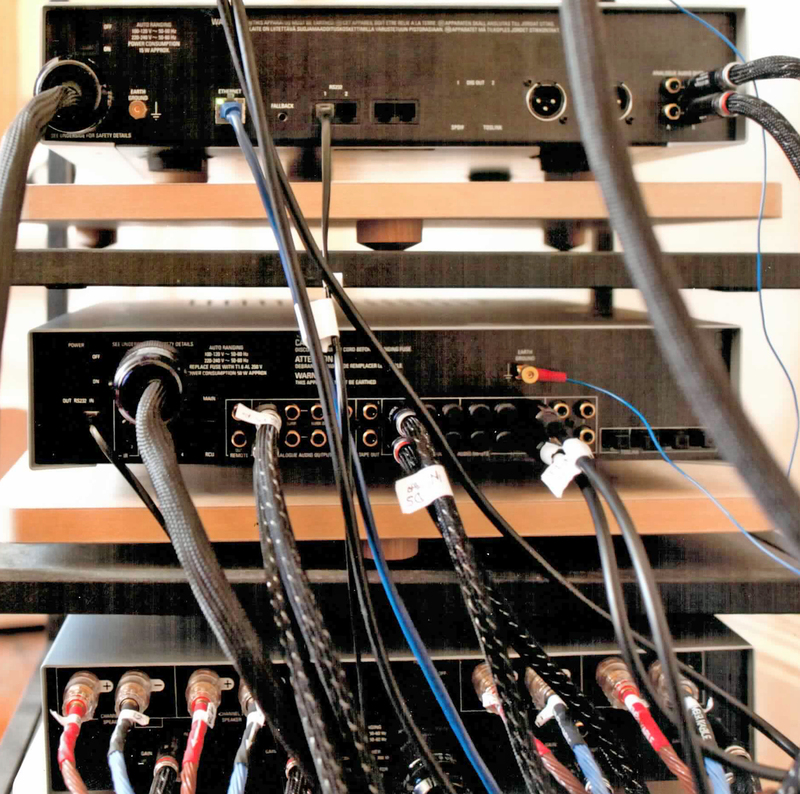 russ andrews advises better mains cables to source(s) first, then pre amp, thirdly poweramp and finally the block. any reason why you have not done this recommended advice ? just out of interest, i use russ andrews signature powerkords on my cd player plus amplifier that are then connected to an ultrapurifier block which has another signature powerkord connected to the wall socket. (my block has an additional mains zapperator plus 8 clarity mains modules installed – highly recommended). my next upgrade, according to russ andrews theory should bes a signature superkord firstly on cd player then on the amplifier and finally to the ultrapurifierblock. your advice/experience would be appreciated. thanks in advance. The reason for the Sawyers Disc Super “Pods” being the first out of the wall socket is pure expediency, not system design. I happened to be ordering that cable when RA introduced the Superkord II or whatever its called, so I elected for that option instead of a regular Signature . I had to concentrate on interconnects, as I had to buy an extra ic to work with the new valve phono pre-amp. The Kimber KS 1036 was on special and its so incredibly effective I just had to have yet another, so I am as of this week KS 1036 as primary interconnect from both the vinyl and the digital streamer. Woo woo! Picking up your theme, the same day I substituted the Signature with a Superkord as primary power lead with the vinyl system, using a friends cable. Contrary to Russ’s hierarchy, the soundstage immediately shrank and performance was crippled. I got witnesses! It was a pretty retrograde step – not at all what I expected, so I have decided against upgrading all the Signatures for the time being. The outlay isn’t cost-effective for me – ymmv. The biggest weakness in the vinyl system I feel is now the Origin Live Encounter arm, so its the next upgrade target, to be replaced by an SME V by the end of the month. Then I might come back to these naughty power leads, and figure why they don’t seem to work for me. That’s the great thing about RA – 60 day trial. hello londonjazzcollecter, thanks for quick reply ! previous to installing a signature powerkord on my cd player (and amp) i tested a classic superkord mk2 as an upgrade to my classic powerkord (apparently a no brainer upgrade). to my surprise, upon initial installment i could not hear much, if any, improvement (?)….. having recently installed a signature powerkord on cd player, i did indeed improve my systems sound, notably slightly better clarity. (although not as big an upgrade as upgrading my amps classic to signature powerkord). the advantage stated of using the signature cable (instead of say the classic, which i previously used) is that the extra conductors equal a lower impedance (and also a more effective rfi cancelling weave) hence easier current flow. apparently the superkord “sawer disks” are passive filters and i have been informed that they do not affect the cables impedance. therefore the results you experienced seem strange, as they are like the effect you would (expect to) experience when installing a cable that has a higher impedance. (russ andrews makes) installed. overall, it just goes to show every item is system dependent and that even with “infrastructure” items, like hardware, more expensive doesn’t equal better performance ! any further comments would be of interest ! As I have said before I am a long term user of RA infrastructure, but am retired now and for me the new wave of Superkords is the stuff of large Lottery wins. I’m not unduly worried by this as what I have sounds pretty good and I also remember the law of diminishing returns. The change from Classic to Reference is nothing like as great as that from the supplied leads to Classic. I will keep buying th Lotto and Eurmillion tickets though. I’ll give you an example. When I first built my DIY tube Phono stage and tube preamp, I thought I could save money and use the thick Power cords that’s very common in computer usage. Everyone has them. As soon as I powered it up. I got huge Hum. I thought I soldered something wrong and after an extension, exhausting search. It was my Computer Power cord. The cord was awful with no insulation from outside interference. Having good Power cords and interconnect makes sense IMHO. Now if you want to argue between ultra exotic wires claimed to be from Pure copper from Mars. That’s another story. Good call MK. The best way to test a cable sceptic is not auditioning an upgrade, but a downgrade. Replace whatever they have with a Maplins straight kettle power lead, and listen to the top-end disappear, booming bass, coarse dynamics, unlistenable. The “cables makes no difference” school gotta struggle to explain the deterioration. The usual laugh at someone making money out of you doesn’t work the other way round. I don’t know about Martian copper, but I have heard for myself the difference a rhodium-plated fuse makes in a power cable (Furutech) . Apparently rhodium has some extraordinary low electrical resistance. In my case the effect was god-awful, but you can no longer say these things “make no difference” . HiFi Tuning gold fuses had a terrible deadening effect. Between all the metals, silver seems to me the way to go. Silver carries signal in a way copper doesn’t. Unfortunately it is very very expensive, but either these things matter to you or they don’t.